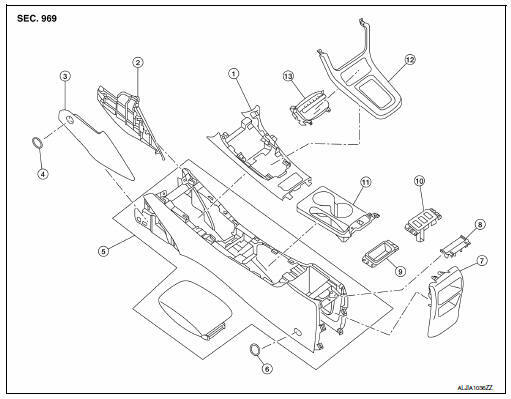 Remove the center console assembly. Refer to IP-17, "Removal and Installation". Remove the center console upper finisher. 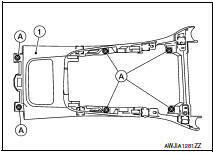 Remove the center console upper finisher screws (A). Release the center console upper finisher pawls using a suitable tool. Remove the center console upper finisher (1). 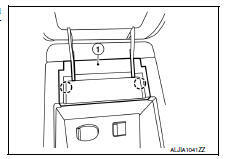 Release the center console rear finisher cover pawls using a suitable tool, then remove the center console rear finisher cover (1). 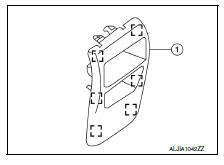 Release the center console rear finisher clips using a suitable tool, then remove the center console rear finisher (1). Release the center console accessory finisher pawls using a suitable tool and remove. Assembly is in the reverse order of disassembly.